The cold season comes with colorful holiday decorations, busy streets and lots of joy. Unfortunately, it also comes with harsh weather that causes snow and ice. A snow fight may be lots of fun, but walking on ice and making your way through snow isn’t. Many people get injured during the cold season because they slip and fall, hurting themselves. You have to be very careful because of the black ice phenomenon, which causes invisible ice to appear on the sidewalk and roads, resulting in many accidents. So what can you do in case of a slip-and-fall accident caused by snow and ice in Maryland? How can you recover damage and bring the responsible ones to justice? Any personal injury lawyer from Maryland knows that MD laws do not favor plaintiffs in slip-and-fall cases that occur because of snow and ice. Most of the cases get dismissed if the victim was able to see the ice. But if we are talking about invisible or black ice, then you may have a valid claim. 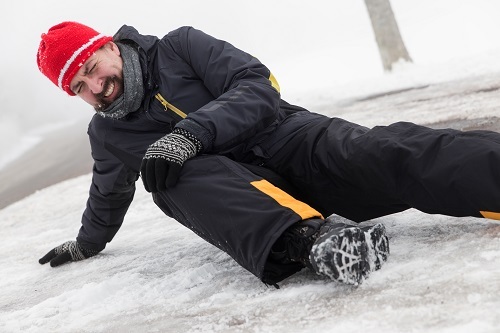 If invisible ice caused your slip-and-fall injury in Maryland, there are a couple of things you can do right after the accident to help your claim. You should be aware that ice melts easily if there is a weather change so, in order to prove the hazardous conditions, photographs may be crucial. The first thing you should do if you suffer a slip-and-fall injury is to get medical help. But while you wait for an ambulance or before going to the hospital, make sure that you gather some initial evidence about your fall and call your personal injury lawyer from Maryland. Get your phone out and take photographs of the scene of your fall. Make sure to capture the ice, where it was located, the surrounding areas and everything related to your fall. Your Annapolis injury attorney may need to prove in court that there was no warning sign about the ice and that the ice was not visible. Ask people who have witnessed the accident to give you their contact information. Their testimonies can prove very valuable in court. As soon as you can, write down all the details about your slip-and-fall accident. Describe exactly what happened, when the accident occurred, what caused your fall, what the weather conditions were and what the owner of the property said. Make sure to preserve the shoes and the clothes you were wearing exactly as they were when you fell. Do not wear them until the trial is over and do not wash or alter them. In most of the cases, the defense will base their strategy on contributory negligence. This means that they will try to prove that you were, somehow, partially responsible for your accident. Most often they will say that you were wearing the wrong shoes but, by preserving your clothing, you can prove that you weren’t. Talk to your Annapolis injury lawyer and tell them everything that is related to your accident. They will counsel you and strategize to get you the compensation you deserve. For more information about slip-and-fall claims, contact the best Annapolis injury attorney at (443) 569-3950 or by email at [email protected] and receive a free consultation.